The German generals – Kurt-Jürgen Freiherr von Lützow, Gustav Gihr, Friedrich Golwitzer, Paul Gustav Völckers, Rudolf Bamler, Hans-Walter Heyne, Adolf Hamann, Vincenz Muller and others – before the march of German prisoners in Moscow. 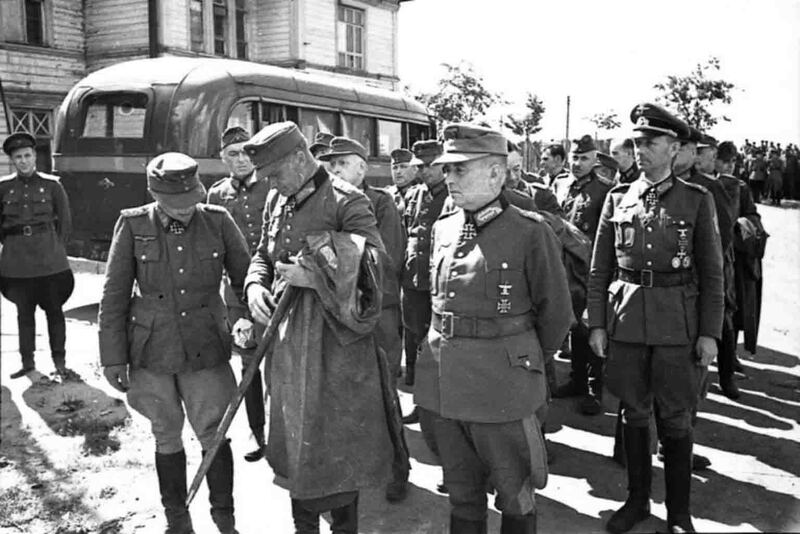 During the Belarusian offensive operation of the Soviet troops, of the 47 Wehrmacht generals who served as commanders of corps and divisions, 21 were taken prisoner. 19 of them were held in Moscow in front of thousands of columns of German prisoners. March of the German prisoners took place on July 17, 1944, demonstrating to Soviet people, as well as to the allies of the USSR, who did not believe in the successes of the Red Army, the results of the defeat of the German troops in Belarus. About 57,000 German soldiers and officers, mostly captured in Belorussia by the troops of the 1st, 2nd and 3rd Byelorussian Fronts, marched along the Garden Ring and other streets of Moscow.